2 Packs Bob Marley Pure Hemp Rolling Papers King Size 33 Leaves $1.46 a Pack! CHILLS ALIEN King Size Select Hemp Rolling Papers. ONE PACK. 33 leaves a pack. 3 Packs Bob Marley Pure Hemp Rolling Papers King Size 33 Lvs ONLY $1.23 a Pack! 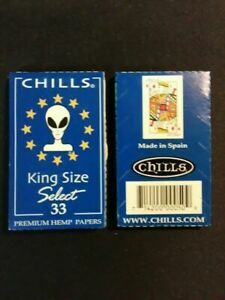 Details about CHILLS ALIEN King Size Select Hemp Rolling Papers. TWO PACKS. 33 leaves a pack.